Put on your sunglasses to enjoy Dusdee Chotipruk’s small sculptures, hangings and jewelry. This picture of her work area shows how she immerses herself in color. Thailand’s popular Dichan magazine featured Dusdee in its June issue. “I am a very low profile person but my creations may be loud,” she says. 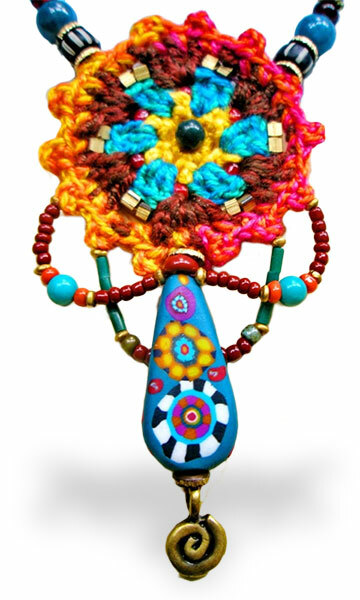 She mixes crocheted rounds, bright polymer canes and glass beads into an updated ’60s fashion statement. What a fantastic use of color! Aow’s work is really unique…. I have been following her for a long time and her vision is always fresh and delightful. How Carnivale! Love the bright, fun, vibrant colors:) They jump off the page!